Bcr-Abl oncogene is generated by a reciprocal translocation between chromosome 9 and 22 in human genome, giving Bcr-Abl protein with constitutive tyrosine kinase activity . Bcr-Abl constitutively activates multiple signaling pathways such as Janus family of kinase/signal transducer and activator of transcription (JAK/STAT) pathway, and phosphatidylinositide 3-kinase/protein kinase B (PI3K/AKT) pathway [2–5], which results in cytokine independent proliferation, thereby leading to chronic myeloid leukemia (CML) and acute lymphoblastic leukemia (ALL) [6, 7]. 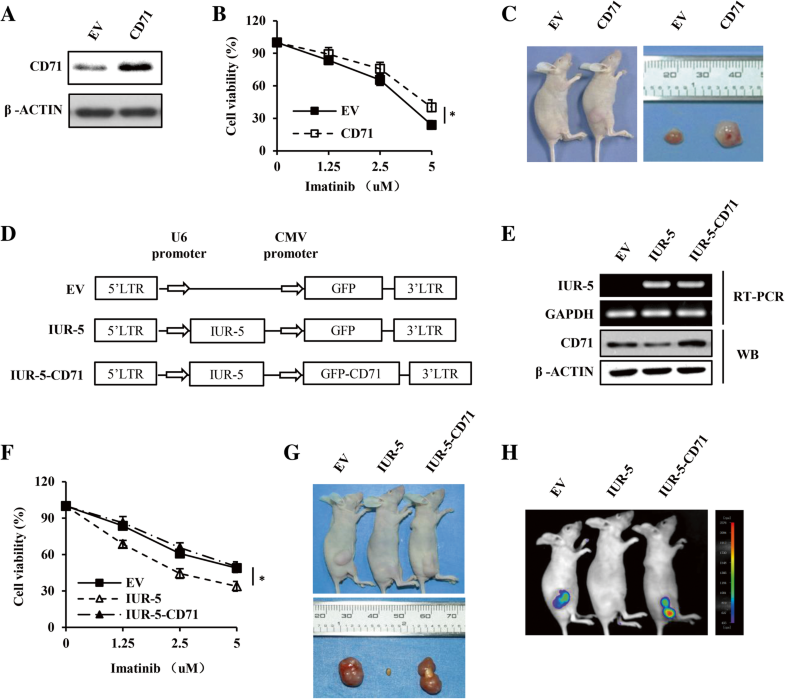 Besides, v-Abl, the retrovirally transduced product of Abl gene, contributes to murine pre-B cell malignant transformation . Owing to development of tyrosine kinase inhibitors (TKIs), especially the first-generation imatinib, over 90% of CML patients have been cured in recent years [1, 8, 9]. Imatinib can competitively bind the adenosine triphosphate (ATP) binding pocket of Bcr-Abl, and effectively inhibit its tyrosine kinase activity [8, 9]. Rapidly, the second-generation drugs targeting Bcr-Abl (dasatinib, nilotinib, and bosutinib) and most recently the third-generation inhibitor ponatinib with similar mechanisms have been developed . Although significant progress has been made in treatment of Bcr-Abl-positive hematological malignancies, the precise mechanisms underlying Abl-mediated leukemogenesis are not fully understood. Our previous studies have revealed the functional involvement of lncRNAs in Bcr-Abl-induced CML [18–20]. For example, we have identified lncRNA-BGL3 as a tumor suppressor in Bcr-Abl-mediated tumorigenesis . 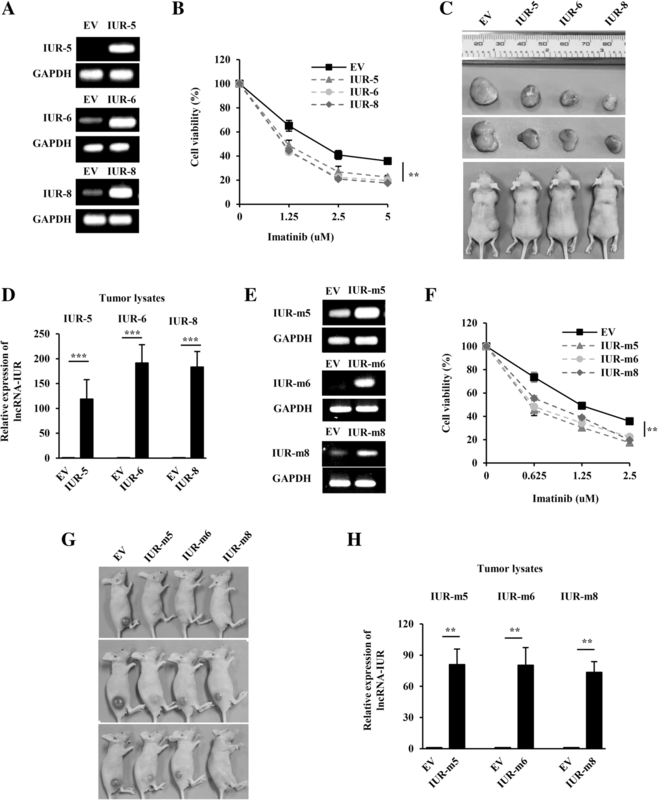 Upregulation of lncRNA-BGL3 occurs in K562 cells after disruption of Bcr-Abl expression and in primary CML cells derived from patients in response to imatinib treatment; lncRNA-BGL3 functions as a competitive endogenous RNA (ceRNA) to cross-regulate the expression of phosphatase and tensin homolog (PTEN), thereby modulating leukemic cell survival . 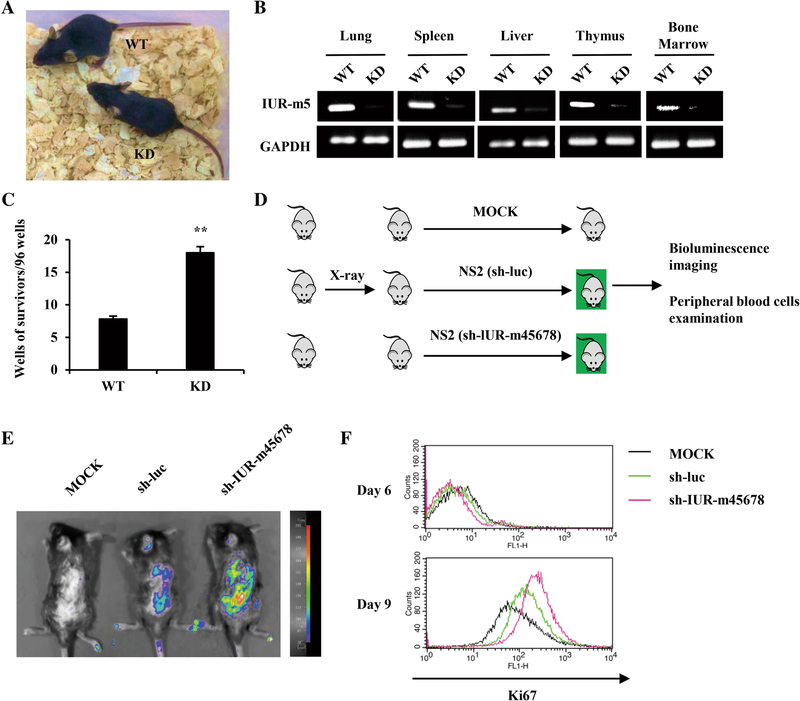 In addition, we have demonstrated a critical requirement for lncRNA H19 in Bcr-Abl-mediated tumorigenesis . LncRNA H19 expression increases remarkably in Bcr-Abl expressing cell lines and primary CML patients, which is regulated by c-Myc and associated with Bcr-Abl-induced cancer . Despite their importance, the functional relevance of lncRNAs in cellular transformation by Abl oncogenes remains largely unknown. Next, we sought to determine the mechanism of the tumor suppressive action of lncRNA-IUR. Since our lncRNA microarray data showed that lncRNA-IUR-5 expression was significantly increased upon imatinib treatment (Additional file 2: Figure S4A), we hypothesized that lncRNA-IUR-5 may target the Bcr-Abl-mediated expression of genes. To test this hypothesis, we performed transcriptome RNA-seq analysis of lncRNA-IUR-5 knockdown K562 cells and control cells (Fig. 6a). 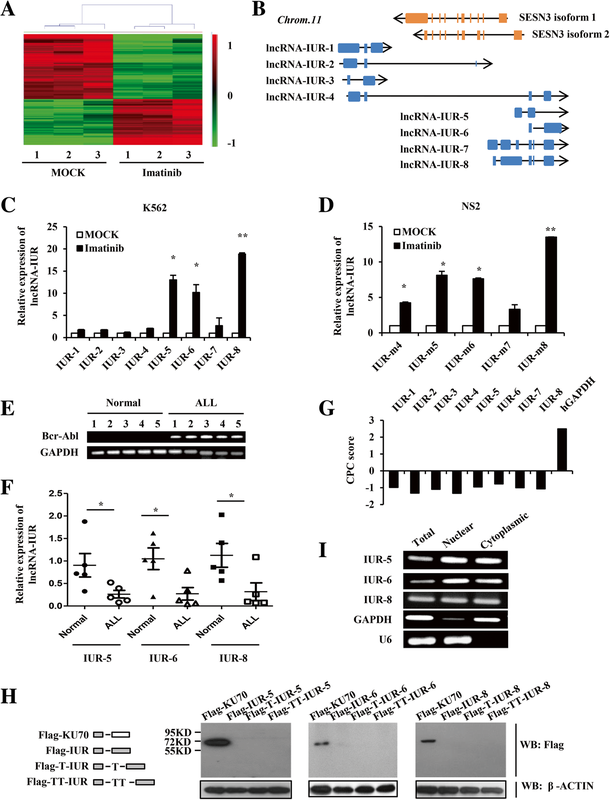 Disruption of lncRNA-IUR-5 significantly altered the expression of 39 genes. Interestingly, all three isoforms of transferrin receptor protein (TfR or CD71) were greatly upregulated in lncRNA-IUR-5 knockdown cells (Fig. 6a). CD71 is a cell membrane-associated glycoprotein involved in the cellular uptake of iron and the regulation of cell growth , and CD71 is ubiquitously expressed at a low level in most normal human tissues but greatly elevated in cancer cells, which makes it an attractive target for cancer therapy including leukemia [25–27]. We confirmed that protein expression of CD71 was increased after silencing lncRNA-IUR-5, whereas its level was reduced by overexpressing lncRNA-IUR-5 in K562 cells (Fig. 6b). 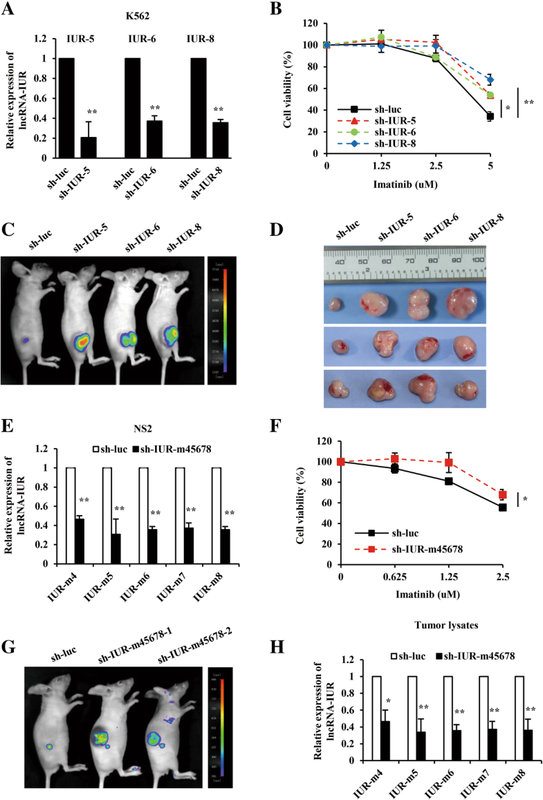 These data indicate that lncRNA-IUR-5 negatively regulates the expression of CD71 in the leukemic cells. STAT5 has been reported as a transcription factor of CD71 . Importantly, STAT5 is a key factor implicated in numerous human cancers [29–31]. 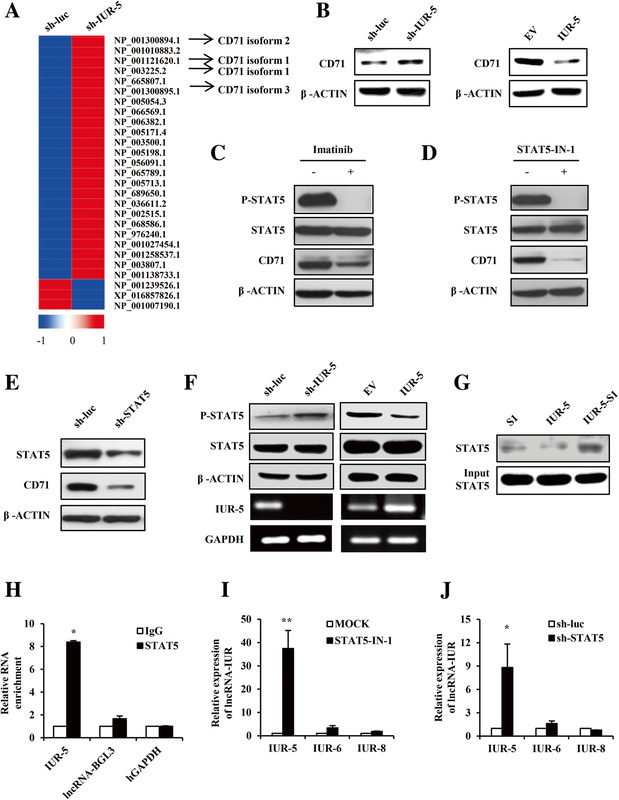 Activation of STAT5 is critically associated with Abl-mediated leukemia and can be effectively inhibited by imatinib [32–34]. In this study, we found that the phosphorylation level of STAT5 and protein level of CD71 were markedly reduced in K562 cells treated with imatinib (Fig. 6c). Furthermore, inhibition of STAT5 activity by STAT5-IN-1, an inhibitor of STAT5, caused a striking decrease in the protein level of CD71 (Fig. 6d). 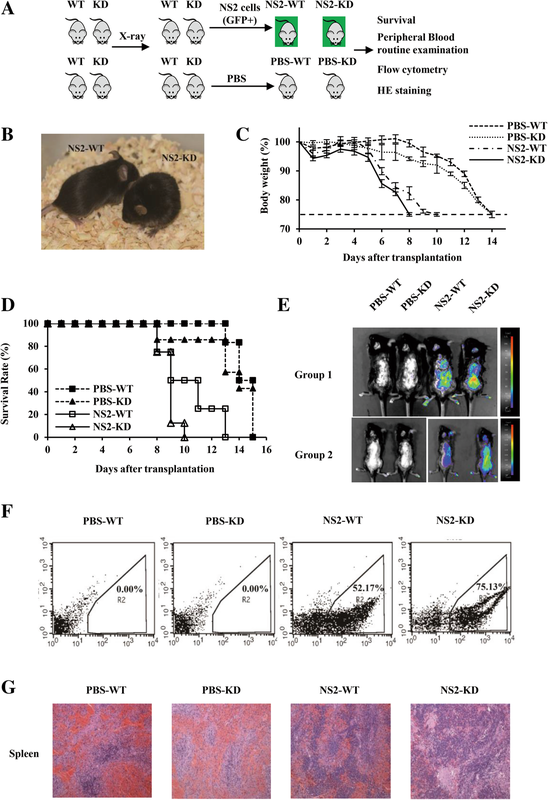 Similar results were obtained from experiments using shRNA specifically targeting STAT5 in K562 cells (Fig. 6e), confirming that STAT5 positively regulates CD71 expression in the Bcr-Abl expressing leukemic cells.